Proof that franchising can be just as lucrative as running your own business, a franchisee for World Options has been awarded after generating over £1m revenue for his franchise arm over the last 12 months. Stuart Douglas from Guildford was presented with the Millionaires Row accolade at the online parcel delivery service’s national conference for franchisees, where it gathered its franchise network to celebrate its recent successes. Since becoming a franchisee for World Options four years ago, Douglas has become the chain’s highest earning franchisee making £1m in sales of online shipments and impressive £500,000 gross profit in the last 12 months. Alongside Douglas, Russ Thornton and Steve Brock from the Manchester South franchise were awarded second place for also achieving Millionaires Row status. 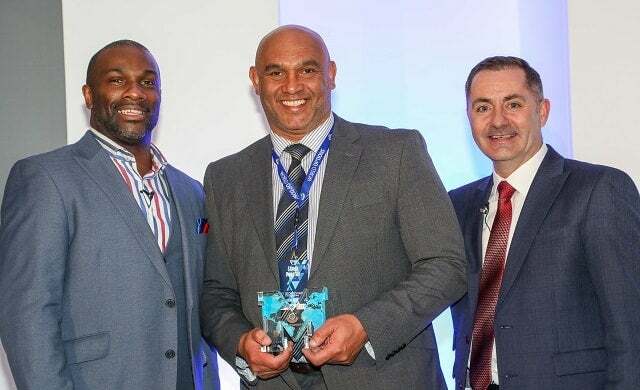 The conference, which took place at the Hilton in St George’s Park, was also attended by World Championship and European Championship gold medallist Derek Redmond (pictured left) who spoke about overcoming adversity to reach success. Redmond was famously carried across the finishing line by his father when he pulled his hamstring at the 1992 Olympics. With over 75 franchisees operating across the UK, World Options is looking to help more budding entrepreneurs follow in Douglas’ footsteps. The franchise promises flexible hours with a home-based business opportunity, access to world-class software, and 100% residual income. “The last 12 months have been an exciting and busy time for us, we have invested in new IT systems to help World Options franchisees become even better at what they do. “And since the official opening of our offices in the USA in January 2018 we are now authorised resellers for UPS, only the second company to do this in the USA, which is a fantastic position to be in.